The town of Sandwich was already 300 years old when Richard The Lionheart came through on his way back from the Third Crusade in 1194. A half-hour east of Canterbury, it was one of southeastern England’s Cinque (Five) Ports designated by King Edward I in 1155. 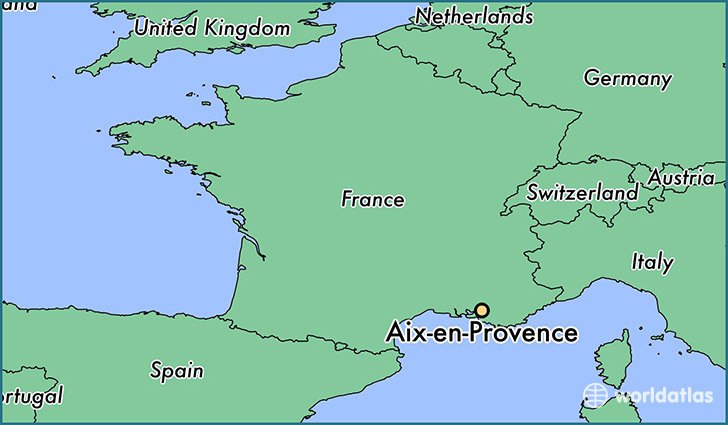 In exchange for annually providing ships and sailors for the country’s defense (there wasn’t yet a Royal Navy), the five ports were given their own powers of taxation, law enforcement, and other commercial privileges. I walked through the town with two volunteers from the very active local historical society. The town had recently received a grant to renovate the local museum, so it was closed amid an uproar of construction noise when i arrived. By prior arrangement, however, they opened it for my guides so I could see their crown jewels, as it were: their copy (one of 6 in the world) of the Magna Carta and the contemporaneous (and equally important) Charter of the Forest. The two documents were in temporary bullet-proof cases askew in a corner of the room. Amid electrical cords, knee pads, and drafting tools, I gawked. 1215. A king blackmailed into sharing power with non-royal nobles. A king binding future kings to his commitments. Habeas Corpus and trial by jury. Surrounded by workmen intent on finishing the building in time for the gala opening just a week away. 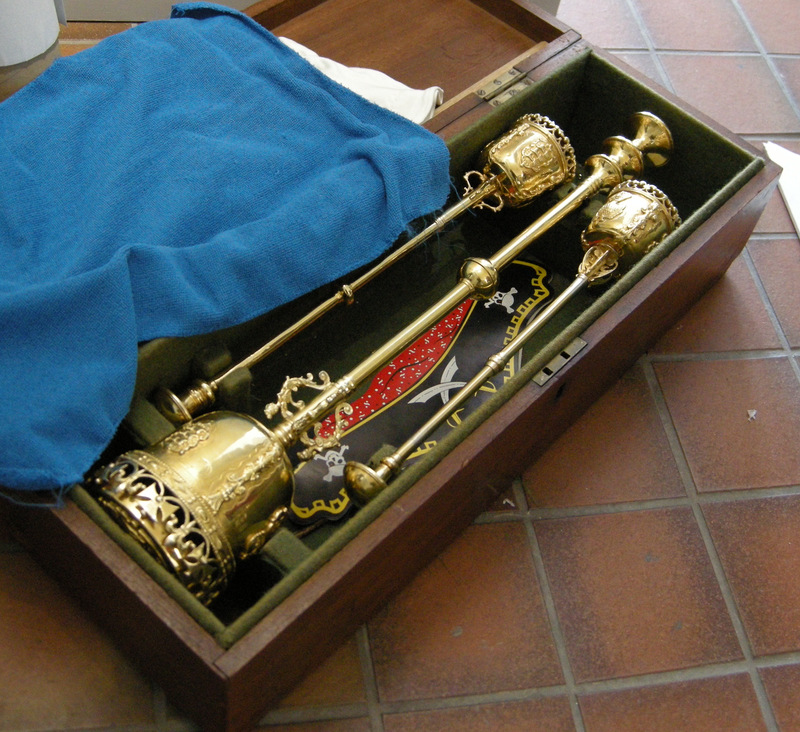 Before I left, I was shown the town’s gilt mace and scepter, in use since the 15th century. The museum director even let me hold them. I let her lift them out of the box just laying on the floor that she had opened. The symbols of royal authority, granted to very important locals, now used in ceremony one day a year. Except for today, when they were tenderly handed to a foreign visitor who was appropriately blown away. They really wanted us out from underfoot, so we hustled out of the almost-finished museum without–oh wait, you just HAVE to see this, the museum director said. Lying on the floor on a pillow under a chair was a life-size stone head sculpted in Roman times. It had been found in the local river twenty years ago by two boys. Upon bringing it home they were promptly scolded for taking something that wasn’t theirs, and told to put it back. 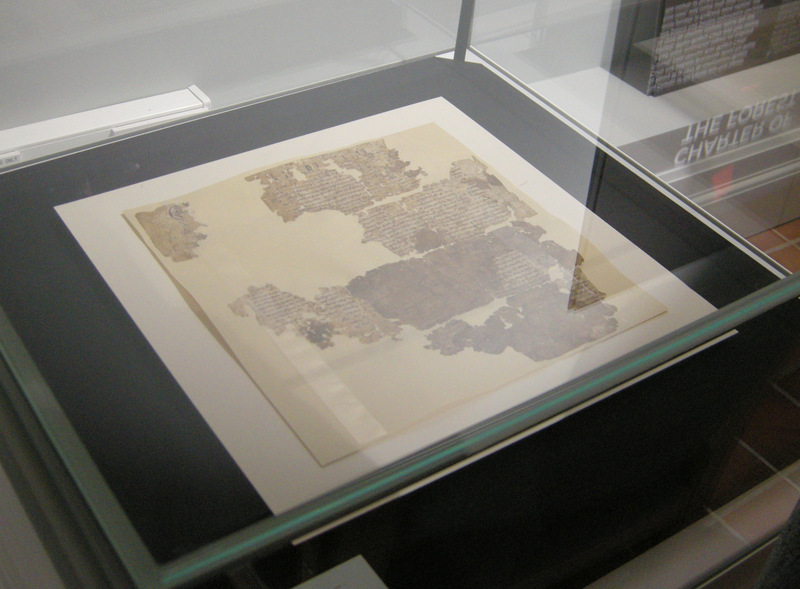 It found its way into private hands, where it stayed until the Museum re-opening was announced. The owner then unexpectedly stepped forth and donated it, where it will be displayed. How important was Sandwich? Back in the day, even Queen Elizabeth I visited. 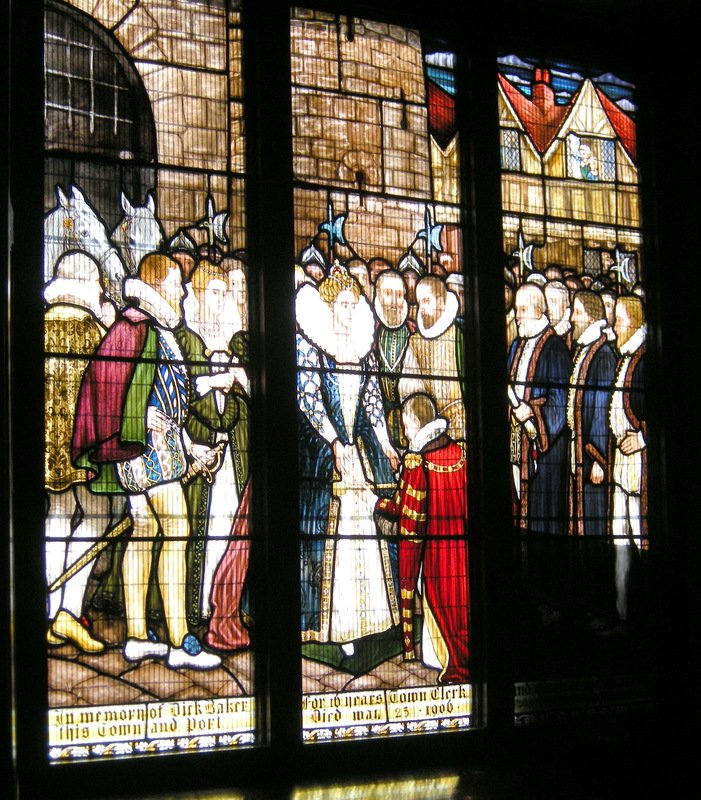 In the old town hall, I saw the large stained glass window commemorating her visit, her face clearly recognizable. In fact, the Mayor kneeling at her feet is holding the same gilt rods I had held earlier that day. The old town hall had also been used as a courtroom. The 16th-century furniture was still in place, just as shown in a large contemporary painting that hung opposite the window. Walking through town, we visited several churches. The recurring theme here was the battle between sate-sponsored Catholicism and Protestantism, as monarchs such as Henry, Mary, and Elizabeth whipsawed the country between Roman and Reformation demands. It wasn’t hard to remember seeing Tyndale’s illicit Bible just 48 hours ago in Canterbury Cathedral’s library. The next chapter of the story, however, was very much alive here too: the Puritans. Exiled under (Catholic) Queen Mary, they burst back into English life with Elizabeth I’s accession in 1558, becoming a potent political force in the 17th century. Among other things (like going to the Netherlands and thence to America), they went through churches they deemed insufficiently “reformed,” damaging the art, architecture, and religious objects they felt reminiscent of Catholicism. In church after church right here in Sandwich, I saw evidence of their zealous vandalism. 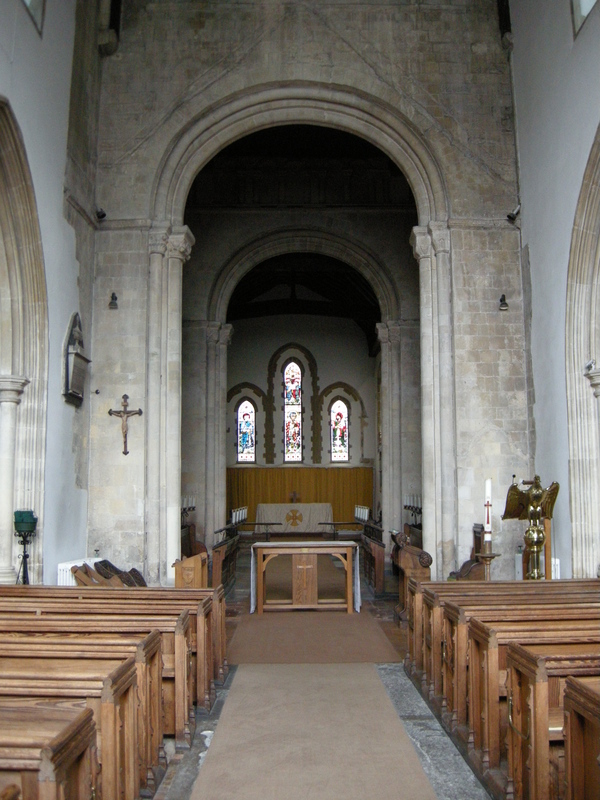 Here in Sandwich’s various churches I also saw the old Norman style arches–fluted and enormously high. One would even say the height was out of scale–except somehow, eight or nine centuries ago, they found a way to make them part of buildings of both gracefulness and power. Incredible. This entry was posted in architecture, English history, medieval history and tagged magna carta, reformation, stained glass. Bookmark the permalink. Enter your e-mail address to subscribe to my blog and receive e-mail notifications of new posts.